Lately, I've been obsessing with calibration standards. I know that it is an overkill to use lab-grade calibration kit rated for up to 26 GHz with a home-brewed 60 MHz VNA, but the commercial calibration kits are well documented and come with cal reference definitions (data about offset delay, stray C for the OPEN, stray L for the SHORT, etc. The data is stored on a disk and normally loaded in the VNA but it will give me chance to properly measure/characterize my DIY calibration kit. This way I can have the proper constants for my DIY standards entered in MyVNA software. 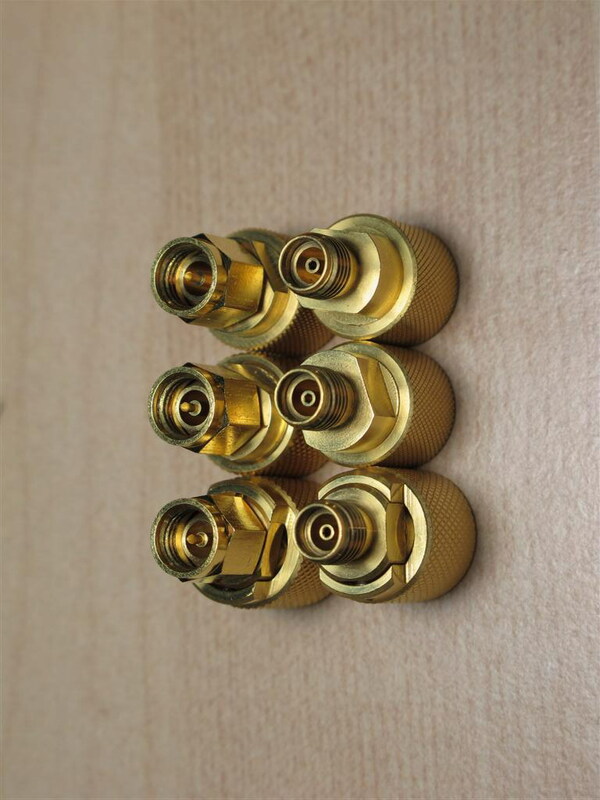 It will also help me to match the calibration plane with the port connector mating plane and measure other connectors or adapters. I picked up a nice calibration kit on eBay for a very reasonable price (these kits are normally VERY, VERY expensive, but I guess I was lucky this time). The kit is equipped with 3.5 mm connector. This type connector was developed by Hewlett-Packard and it is used in lab instruments for microwave measurements. The 3.5mm connector is using air dielectric and it is machined to extremely tight tolerances. It is rugged (compared to the SMA), allowing thousands of connect-disconnect cycles with repeatable results. The beauty is that it mates with standard SMA connectors. On the flip side - it is a precision lab grade connector and one should be extra careful when handling and using - it could be easily damaged when mated with low-quality SMAs or by poor mating technique. The geometry and construction of the 3.5 mm connector provides mode-free operation up to 34 GHz. My kit is actually made of two different sets - the male cal standards are rated for up to 26 GHz and the female for up to 9 GHz. Such kit requires proper care and storage. 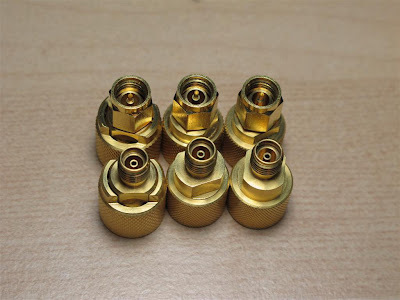 The male pin and female receptacle are supported only in the back of the connector (air dielectric) and can be damaged by rough handling/cleaning. Enemy #1 of these connectors are low-quality or already damaged SMAs. When mated with such, a damage is almost certain to occur. "DO NOT ROTATE"! This is very important rule when the 3.5 mm calibration connector is mated! The cal standard must be held / clamped in a way to prevent any rotation of the whole cal standard body - only the nut should be rotated. This is especially important with the female connector! The pin receptacle of the female connector is EXTREMELY DELICATE! The female pin receptacle under 10x magnification. Note the 6 contact fingers, lining the inside wall of the pin receptacle. They are barely visible on the picture under 10x magnification and even people with very good eyesight could not always see with a naked eye if there is a damage. When the body of the connector is rotated during mating or any of these contact fingers gets caught by a burr on a low-quality male SMA center pin, the whole calibration standard becomes a very expensive paper-weight. A center pin, protruding too much, pin with out of specs diameter, misaligned pin, improper cleaning attempt are just some of the things that can cause irreversible damage to the female receptacle. The male pin of the 3.5mm is more rugged but still requires a lot of attention when mated or cleaned.